Can the Great Barrier Reef survive climate change? Words by Daisy Dunne. Multimedia by Rosamund Pearce and Tom Prater. “The insidious thing about climate change is there’s nowhere to hide from it,” says Prof Terry Hughes, director of the Australian Research Council's Centre of Excellence for Coral Reef Studies at James Cook University in Townsville, a sleepy city in northern Queensland where even the winter sun beats down at 31C. Small-scale bleaching is a common sight on the reef, but 1998 marked the first year that saw widespread bleaching, Hughes says. That year, 42% of the reef turned white. The Great Barrier Reef is the world’s largest living structure – made up of 3,000 individual reefs spread over an area the size of Italy or Japan. The first mass bleaching affected around 4,200 sq km of coral, according to Hughes. 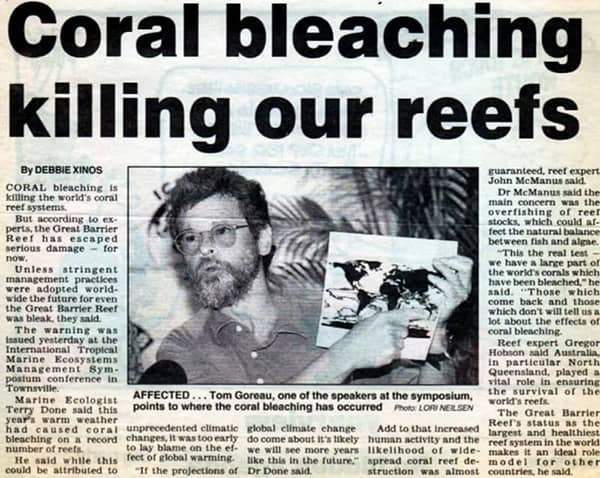 Townsville Bulletin, 1998. Credit: globalcoral.org. The second mass bleaching occurred four years later, in 2002. This time, 54% of the reef was affected. “We had a very long gap – a 14-year gap – and we were just simply lucky,” Hughes says. The third mass bleaching episode came in 2016, this time causing 93% of the reef to bleach. Most of the damage was concentrated in the northern section of the reef, where sea temperatures were particularly high, according to aerial surveys undertaken by Hughes. Here, 81% of the coral bleached severely – while only 1% escaped bleaching altogether. The Great Barrier Reef is the world’s largest living structure. It is made up of 3,000 individual reefs that are spread across an area the size of Japan. It is so large that it can be seen from space. The reef was made a world heritage site in 1981. The area is home to 1,600 fish species, 20 seabird species and six out of seven of the world’s turtle species. Since then, the reef has faced four mass bleaching events. Bleaching occurs when a stress – mostly high sea temperatures – causes coral to release its colourful algae. This leaves it a ghostly white. Algae acts as a source of food for coral and, without it, they slowly starve. It was in 1998 that the reef faced its first mass bleaching event. That year, 42% of the reef turned white. The second mass bleaching event hit the Great Barrier Reef in 2002. This time, 54% of the reef bleached as a result of high sea temperatures. Mass bleaching returned to the Great Barrier Reef after a 14-year gap. This time, 93% of the reef bleached. Temperatures were so high that parts of the reef “literally cook[ed] to death”, says coral scientist Prof Terry Hughes. That year, 30% of the reef’s coral died – mostly in just two to three weeks. Damage was worst in the northern part of the reef. Here, 81% of the coral bleached severely – while only 1% escaped bleaching altogether. A study found that, six months after the bleaching event, the make-up of species living in this part of the reef had become less diverse. One year later the reef bleached again. This time, 83% of the reef’s coral turned white – a small decrease on the area affected in 2016. This is not necessarily a positive thing, however, Hughes says: “In the north, the reason it didn’t bleach so much in year two is because all the heat-susceptible [coral] had [already] died. Last November, temperatures in Townsville rocketed to 41.7C – the hottest November day recorded in the city. In the days that followed, temperature records were broken across the state of Queensland, while unprecedented bushfires – fuelled by the heat – forced thousands from their homes. However, just a few weeks later in January, Townsville faced unprecedented summer rainfall. In just one week, the city received the equivalent of its annual rainfall, causing widespread flooding that forced hundreds to evacuate. 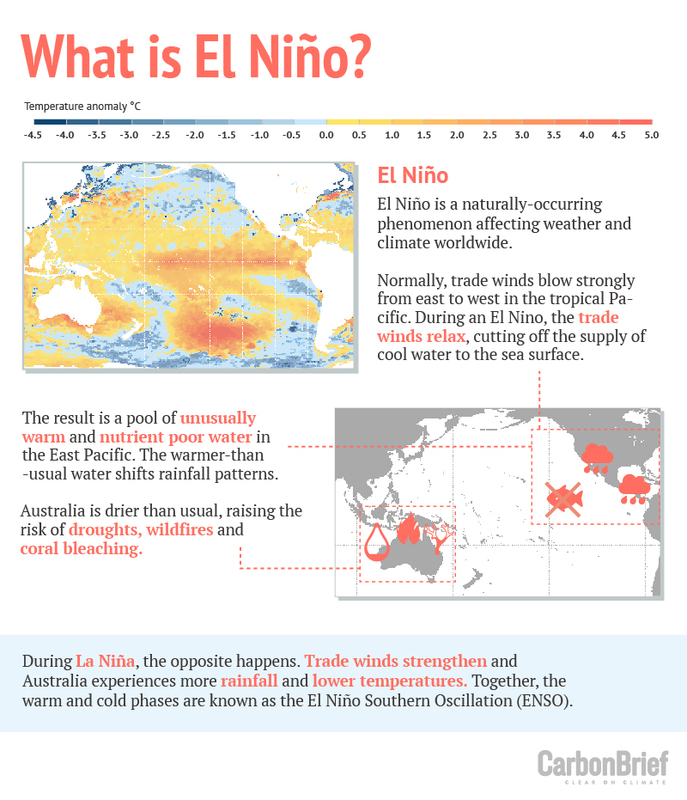 El Niño is natural weather phenomenon that develops in the Pacific Ocean. Every few years, a chain of events between the ocean and atmosphere causes sea surface temperatures to become unusually warm in the East Pacific. The warming shifts rainfall patterns, causing Australia to become drier and hotter in the summer. This can be followed by an unseasonably cool period, known as La Niña. The entire natural cycle is known as the “El Niño Southern Oscillation” (ENSO). Dead coral at Lizard Island, Australia, 2016. Credit: The Ocean Agency/Catlin Seaview Survey. The repercussions of mass coral die-off across the reef are hard to quantify. The reef is home to more than 1,600 species of fish and 10% of the world’s total fish population. The underwater ecosystem supports dozens of whale and dolphin species and six out of seven of the world’s sea turtle species. It also plays host to more than 20 seabird species, which fish and nest on the reef’s islands. The reef’s biodiversity attracts two million visitors a year – providing jobs for around 65,000 Australians. This tourism generates an annual sum of £2.8-3.4bn (AUS$3.6-4.3bn). Fish counts undertaken from 2014 to today suggest that numbers of parrotfish, butterflyfish and damselfish have declined in some parts of the reef. However, it is difficult to tell whether this decline is a direct result of coral bleaching, or some other environmental stress, such as overfishing. There is, however, evidence to suggest that bleaching could be changing the makeup of species found on the reef. A survey taken eight months after the 2016 event found that, following bleaching, the mix of wildlife found across the reef appeared to be less diverse. Another study looked at animal diversity across the reefs of Lizard Island – in the northern part of the Great Barrier Reef – before, during and six months after the 2016 bleaching event. It found that while most coral species bleached during the event, some types of coral faced higher rates of mortality than others. Devil's hand coral. Credit: Roberto Nistri/Alamy Stock Photo. This is because, in a reef ecosystem, each organism provides a unique ecological service, Richardson says. As the community of organisms found on the reef becomes less diverse, some of these vital services could be lost. Coral die-off could also be having indirect effects that may go unnoticed by the average snorkeller, research suggests. A study published in 2018 found that damselfish, which normally use coral to hide from large predatory fish, choose not to shelter in dead coral – despite it providing the same level of protection as living coral. “It appears that the presence of live coral rather than shelter per se is the necessary cue that elicits the appropriate behavioural response to potential predators,” the authors write in their research paper. Damselfish. Credit: Klaus Steifel via Flickr. A second study published in 2018 found that, following coral die-off, butterflyfish – which feed on coral – not only ate less often, but also changed their behaviour towards each other. Out on the reef, butterflyfish often guard patches of coral that they feed on. If another fish approaches their patch, they can become aggressive and chase their rival off. However, after a coral bleaching event, the amount of aggressive behaviour displayed by butterflyfish can fall by up to two-thirds, according to the research. This is likely because, following bleaching, the fish have less to eat and so lack the energy to show aggression, the authors say. A loss of aggression could cause the territories normally held by butterflyfish to break down, the authors say. “Territorial breakdown could lead to dampened dispersal among reefs, together altering community dynamics.” Shifts in the community of coral species found on reef could increase the risk of local extinctions, they add. Butterflyfish feeding on Lodestone Reef, the Great Barrier Reef. Credit: Daisy Dunne. For coral, bleaching is not the only consequence of climate change. Ongoing research suggests that changing sea temperatures could be influencing the time that some corals choose to “spawn”, or release eggs. Though immobile, corals are animals and reproduce by “external fertilisation” – a fusion of sperm and eggs that takes place outside of the mother organism’s body. In the Great Barrier Reef, hundreds of species take part in “mass spawning” – the release of millions of sperm and eggs at the same time. This event sparks a feeding frenzy for small fish and other animals that eat coral eggs. Scientists studying the phenomenon have discovered that mass spawning usually occurs around one week after a full moon. However, the exact month and time that spawning occurs is likely to be controlled by something else – potentially sea surface temperature. For the past 20 years or so, Prof Andrew Baird, a coral reef ecologist from the Centre of Excellence for Coral Reef Studies at James Cook University, has visited sites across the reef to record the month and timing of spawning for a group of hard corals known as Acropora – or staghorn corals. The group includes more than 150 species globally and is typically the most common coral group found in the Great Barrier Reef. Prof Andrew Baird checks if staghorn coral has spawned. Video shot by Giacomo d'Orlando at Magnetic Island, the Great Barrier Reef. Once cracked open, the coral’s developing eggs become visible. If the eggs have some colour, they are mature, and will spawn after the next full moon. If the eggs are white, they are immature and spawning is at least one month away. If the coral contains no eggs, it has either spawned recently or is not likely to spawn anytime soon, he says. In 2016, Baird and his colleagues published the results of a 12-year study looking at drivers of coral spawning across the Indo-Pacific region. To do this, the researchers recorded the month of coral spawning at 34 reefs across the region, including in Australia, Indonesia, India and Egypt. However, the research by Baird’s group found that the best predictor of coral spawning time was sea temperature. Specifically, a sharp increase in sea temperature from one month to the next. Prof Andrew Baird shows a cracked staghorn coral to journalist Daisy Dunne. Credit: Giacomo d'Orlando. Researchers are still not sure why coral could be timing their spawning to coincide with sharp changes to sea temperature. One theory is that sea temperature could affect sperm’s swimming ability, while another theory suggests that temperature could help regulate the production of sperm and eggs. One important implication of these findings is that, as the climate changes, the month of coral spawning could become “decoupled” from other important ecosystem processes, Baird says. Climate change could also pose a risk to coral by driving “ocean acidification” – a phenomenon that occurs as seawater absorbs CO2 from the atmosphere. Of the CO2 released into the atmosphere by humans, around 30-40% of it dissolves in the oceans, while the rest remains in the atmosphere or is absorbed by living things on land. This has caused oceans, which are alkaline, to become more acidic over time. The overall pH of seawater has fallen from 8.2 to 8.1 from the start of the industrial era to present day. The chemical reactions associated with ocean acidification also drive a reduction in the availability of calcium carbonate – a compound that hard corals use to build their tough outer shell. With less calcium carbonate available, hard corals find it more difficult to repair or grow their skeletons. Research released in 2016 found that some parts of the Great Barrier Reef are “highly vulnerable” to the impacts of ocean acidification. A second study published at the same time found ocean acidification is already harming parts of the reef. It estimated that, at One Tree Island in the southern Great Barrier Reef, the rate that corals can rebuild their skeletons is now 7% lower than during pre-industrial times. Aerial view of One Tree Island, a coral cay of the Bunker Group on the Great Barrier Reef, Australia. Credit: Manfred Gottschalk/Alamy Stock Photo. A large driver of pollution is nitrogen fertiliser run-off from sugar-cane plantations and other types of farming. Research has found that, once washed into rivers, farming pollutants can travel up to 450km to reach and contaminate reef waters. The nitrogen in fertilisers can spark the growth of algae blooms, which “smother” coral, preventing them from receiving sunlight. A report by WWF released in December, 2018 found “alarming” levels of pollutants present in the blood of sea turtles. Analysis of the animals’ blood and cells found traces of metals such as cobalt, antimony and manganese. A possible source of these pollutants could be nearby industrial activity, such as mining, the authors say. A patient of the Turtle Hospital at the Reef HQ Aquarium in Townsville, Queensland. Credit: Daisy Dunne. Vials containing plastics and fishing line fragments extracted from the stomachs of turtles at the hospital. Credit: Daisy Dunne. Adani's Abbot Point coal terminal taken after a coal spill into Caley Valley wetlands 11/04/2017. Credit: Dean Sewell/Oculi via Flickr. Though the reef may be in “poor condition” today, its future could be even more bleak. Among its headline findings, the IPCC report found that 2C of global warming would lead to the loss of 99% of the world’s tropical reefs. And, even if warming is limited to 1.5C, around 70-90% of tropical reefs could disappear. It is worth noting that, at present, the pledges made to tackle climate change by individual countries are not enough to meet either of these targets. If countries fulfill their promises, global average warming is likely to reach 3.3C above pre-industrial levels by the end of the century, according to analysis from independent research group Climate Action Tracker. Without any climate action, global warming could reach as much as 5C. The estimates in the IPCC report are based on a set of studies that use modelling to project how climate change will impact tropical corals. These models consider how climate change could lead to increased sea temperatures and more frequent episodes of extreme ocean heat, known as “marine heatwaves”. Another important issue to consider is “thermal adaptation” – the possibility that, over time, coral species could evolve to become more resistant to extreme ocean heat and so less likely to bleach. This could occur as heat-sensitive individuals die off, leaving heat-tolerant individuals to reproduce and pass their genes along to their offspring. It is important to note that the IPCC projections only consider the impacts of coral bleaching and ocean acidification on coral reefs. This means that any impact from pollution, overfishing or habitat destruction would be in addition to the predicted damage from climate change. Credit: Howard Hall/Coral Reef Image Bank. Another possibility not considered is that researchers could develop some of kind of technology that could lessen the impact of climate change on the Great Barrier Reef. Shortly after the 2017 coral bleaching event, more than a dozen researchers signed a letter published in Nature Ecology & Evolution that called for “new interventions” to “save coral reefs”. “For coral reefs to remain resilient and their services sustained, we argue that new and potentially riskier interventions must be implemented,” the researchers say. The comment article concentrates on two “emerging” techniques: “assisted gene flow” and “synthetic biology”. “Assisted gene flow” would involve introducing coral from other parts of the world where seas are typically warmer than in the Great Barrier Reef. The researchers suggest taking coral from the Persian Gulf, where the bleaching threshold is “3-4C higher” than in the Indo-Pacific region. The hope is that the transplanted corals would breed with native corals and, so, spread their genes for heat tolerance. However, the authors concede that this technique could come with risks. These include that the transplanted corals could bring diseases that native corals are not familiar with, which could spark an epidemic. Another risk is “maladaptation” – the idea that the transplantation process could unintentionally pass on other genes that would cause native corals to become less suited to their environment. For example, transplanted corals could pass on genes that code for a preference for the saltier water found in the Persian Gulf. CRISPR gene-edited mushrooms. Credit: Penn State via Flickr. 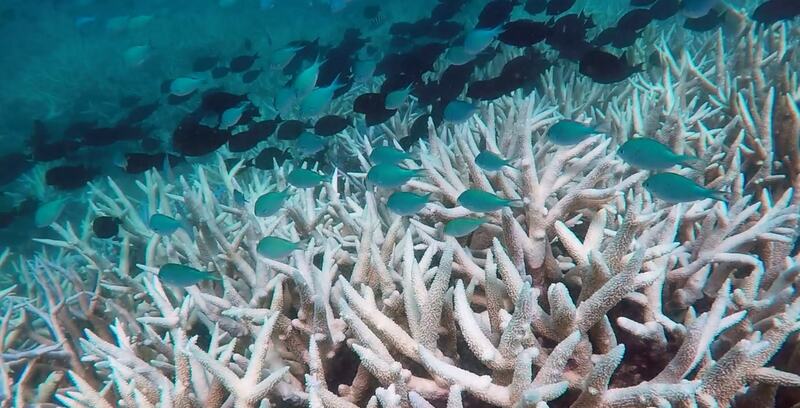 A separate project headed by researchers from the University of Sydney and the Sydney Institute of Marine Science is exploring another type of technology that could be used to tackle coral bleaching. Known as “marine cloud brightening”, this technique would use water cannons to shoot saltwater into the air above the reef. Once airborne, the salt particles would facilitate the formation of marine clouds, the research team says, which could shield coral from incoming sunlight. The proposal has never been tested – but research using computer modelling suggests that this shielding effect could be enough to prevent coral bleaching in the Great Barrier Reef. Several barriers to testing the technology remain, however. Some scientists are concerned that altering the climate above the reef with marine cloud brightening could lead to unfavourable changes to the climate elsewhere, for example. Several other ideas to protect the reef from climate change have been put forward – although not all of them have been subject to peer-reviewed research. In 2017, the Australian government announced plans to spend $2.2m on a controversial scheme to introduce giant fans above a one-sq-km patch of coral in the northern part of the reef. The three-year pilot project would see solar-powered fans mounted onto floating pontoons in attempt to drive water currents that could bring cool water to the sea surface. This could protect corals during bleaching, according to the project’s leader. However, an independent review of the scheme by scientists called it a “major departure from reality”, according to documents seen by the Guardian. The review added that the fans could pump warm water towards deep sea corals, exacerbating the impacts of bleaching. “The notion that we can protect the barrier reef from the next bleaching event by installing fans on one of the 3,000 individual reefs that makes up the entire [reef] is pretty ludicrous,” says Hughes, who was not involved in the review. Another project is trialling the possible use of “artificial reef sunscreen” – a thin layer of calcium carbonate that would sit on the ocean surface above coral, shielding it from incoming sunlight. Preliminary laboratory experiments find the sunscreen can reduce the amount of sunlight reaching corals by 30%, according to the scheme’s benefactors. The project is being funded by the Great Barrier Reef Foundation, an organisation that came under scrutiny after it was handed $443m in government funding in 2018. At the time, the foundation had just six full-time employees and a chair’s panel made up of executives from mining and oil companies, according to Buzzfeed News. Daisy Dunne travelled to Townsville, Queensland in November 2018 to research this article. Interactive, map and animation of coral bleaching designed and developed by Rosamund Pearce. El Niño infographic and animation of ocean acidifcation by Tom Prater, with voiceover by Daisy Dunne. Map data provided by Dr James Kerry of the ARC Centre of Excellence for Coral Reef Studies.